Because Ten possesses a rare supernatural ability to absorb and share light, the Powers That Be have the highest expectations for her future-and the enemy wants her neutralized. Fighting to save her Secondlife, she must learn about her realm from the ground up while launching her first mission: convincing a select group of humans to join her side before they die. No pressure, right? Very exciting with lots of twists! Excellent read!!! 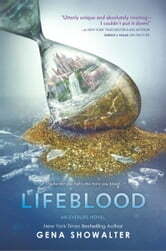 Lifeblood is an emotional book but a very good one, too. If you thought Firstlife was good, get ready for round two. Every corner Ten turns, she is forced to make a decision. The choice, the big one, love or victory, Ten chooses....oops, no spoilers! Read Lifeblood to find out.